Cal Crutchlow pushes for his first MotoGP™ podium of the season in the Monster Energy Grand Prix of France at the legendary Le Mans circuit on Sunday. The Isle of Man based Midlander has been pushing so hard for that podium finish against the factory bikes in the opening three rounds of the MotoGP World Championship and fancies his chances in the 28 lap race round the 2.600 mile Bugatti circuit at Le Mans. It’s the home race for his French-based Monster Tech 3 Yamaha team and the former World Supersport Champion lies fifth in just his third season in the MotoGP World Championship. His team-mate Bradley Smith, who took his very first 125 cc podium in 2007 at Le Mans, starts just his fourth MotoGP race encouraged by his tenth place in the previous round in Jerez. Also encouraged by his Jerez performance is 31 year old Ulsterman Michael Laverty. He scored his first ever world championship points with 13th place at Jerez riding the Paul Bird Motorsport CRT machine. He has finished all three of the opening rounds and improvements to the electronics should see him very capable of more points on Sunday. Twenty year old Gloucestershire Marc VDS rider Scott Redding has made a superb start to his Moto2™ World Championship campaign. Two second places in the opening three rounds sees him trail Spaniard Esteve Rabat in the championship by a single point and the battle will continue in the 26 lap race on Sunday with Redding so close to that first vital Moto2 victory. 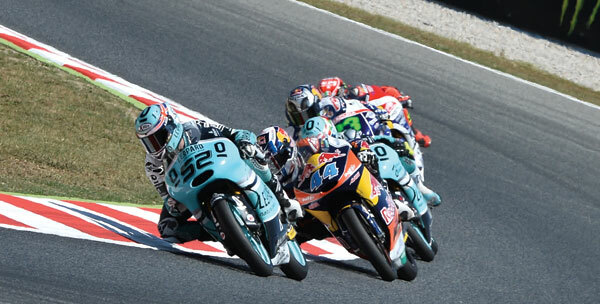 It’s been tougher going for Wiltshire teenager Danny Kent and Spanish-based Yorkshire man Kyle Smith. It’s a big weekend for Kent’s Tech 3 team and the perfect venue for him to start his points scoring campaign while Smith makes his debut at the Bugatti circuit. Londoner Gino Rea makes a welcome return to the Moto2 fray on an FTR machine funded by him and fans (see separate story). It’s better news in the highly competitive Moto3™ class where both Danny Webb and John McPhee scored points in Jerez. Kent-based Webb’s 13th position finish placed him 14th in the world championship after scoring at every round. Scottish teenager McPhee grabbed his first points of the season with an impressive 11th. Londoner Gino Rea makes a welcome return to the Moto2 fray on the FTR Honda after a lot of help from fans, friends and family. They have all clubbed together to finance Rea to race at Le Mans and at least the Hertz British Grand Prix at Silverstone in September after his intended full season ride fell through at the start of the season. Last year Rea finished a brilliant third in the Moto2 race at the rain sodden Malaysian Grand Prix in Sepang riding for the Gresini team. Spaniard Alvaro Bautista has made a steady start to the season on the Go&Fun Gresini Honda but trails Crutchlow by seven points in their battle for fifth while the Ducati duo of Andrea Dovizioso and Nicky Hayden are only two and four points behind respectively. Spaniard Aleix Espargaro has made a great start and is comfortably the top CRT bike on the Power Electronics Aspar machine. He has been top CRT rider in those opening three rounds and leads factory bike riders Andrea Iannone, Stefan Bradl, Smith and Ben Spies who missed the last race through injury. It’s a big race for former Moto2 World Champion Bradl who has crashed the LCR Honda in two of the three races. Old rivals since their schoolboy days Esteve Rabat and Scott Redding are separated by a single point going into the Moto2 battle. Spaniard Rabat has been the surprise of the season taking his first win and pole position at the previous round at Jerez on the Tuenti HP 40 Pons Kalex. Redding, riding the Marc VDS Kalex, has grabbed two second places to trail by that single point. Pre-season favourite and Rabat’s team-mate Pol Espargaro won the opening round in Qatar but a crash in Texas followed by a third in Jerez puts him ten points down on Redding. Former 125 cc World Champion Tom Luthi won the race last year and made a welcome return with a brave 11th at Jerez following his massive pre-season crash. It’s just as close in the Moto3 World Championship with Jerez winner Maverick Vinales, who won his first ever grand prix at Le Mans two years ago, leading Luis Salom by four points. Spanish teenager Alex Rins crashed in Jerez but holds onto third place by a single point from German Jonas Folger. The Moto3 riders will be hoping for a full 24 laps on Sunday with the two previous rounds being halted by a red flag.